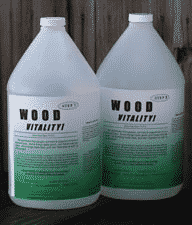 Wood Vitality is a clever means of depositing Zinc Borate inside wood. This offers superior protection agains attack using Zinc Borate. It is especially suitable for historic properties. If you are using wood outside, and you want it to last, treat it first with Wood Vitality, the Environmentally Friendly Wood Preservative. There has long been a need for something that would keep wood from disappearing, especially outdoors. Rain and warmth promote the growth of the rot-fungi and molds that eat wood, and many kinds of insects (particularly termites) have evolved to eat only wood or its cellulose. Even insects that don’t live on a diet of wood use it for a home, boring holes and laying their eggs inside. So, Preservatives were developed and used to treat wood. The chemicals that stop, kill or prevent Small Life from eating the wood, or preserve or protect the wood, are all highly regulated by government agencies. That is mainly because those substances are also harmful to people and mammals. there is thus a real requirement for an environmentally friendly wood preservative. There has long been a need for something environmentally friendly, that would help wood resist attack by Small Life. That need has now been met with Wood Vitality. The result is Fresher-Treated ™ wood, containing the environmentally friendly substance Zinc Borate. This treatment does not corrode steel or galvanized fasteners. The resulting wood is neither acid nor alkaline, but nearly neutral. 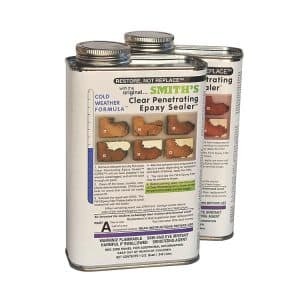 Wood Vitality is a two step waterborne product that impregnates wood with zinc borate, a very well-known, almost insoluble material that is safe for humans and does not interfere with any later wood-treatment, staining or finishing product. Rot fungi, mold and insects don’t like it, not at all; their dinner appears less appealing, very much less appealing. It is essentially harmless to us humans and our pets. These effects of zinc borate have been known for decades. What no one has ever found is a commercially practical way to impregnate a solid piece of timber or a log, with it. Recently, the American Scientist Steve Smith developed a way to put zinc borate inside the wood, and the result is Wood Vitality. It fits very well with the business activities of exterior wood manufacturers, but it can be used by the homeowner or contractor for treating interior and exterior wood, whether or not it will be painted. It is a two-part product; a two-US gallon (7.6 Liters) kit of A and B does up to 200 square feet / 20 square meters. That level of performance would be comparable to the “green” grade of light-preservative-treatment you find in the lumber-stores. For ultimate performance for tens of years, the maximum level needed in wood is considered to be about ¾% by weight. One quart of each component will deliver that performance in one board-foot of lumber. That performance level can be cost-effective when concentrates are purchased in drum quantities.